Concentrated - Makes 640 gallons. That's only $0.20 Per Gallon! 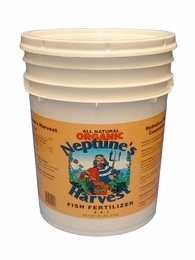 Neptunes Harvest is an organic fertilizer made from fresh North Atlantic fish. It is made by a unique cold process that protects the vitamins, amino acids, enzymes and growth hormones. It also contains all the micro and macro nutrients naturally found in fish. The nitrogen and other nutrients are chelated, so they are readily available for plants consumption. Unlike fish emulsions, Neptunes Harvest retains the fish proteins and oils and has no unpleasant odor. University studies have shown Neptunes Harvest to outperform chemical fertilizers.